Here is another image that I composed. I have entitled this piece "Pursuit." Hasegawa Ki 84 "Frank" (photographed twice) built straight from the box using kit decals, and finished in Aeromaster Warbird Acrylic paints. 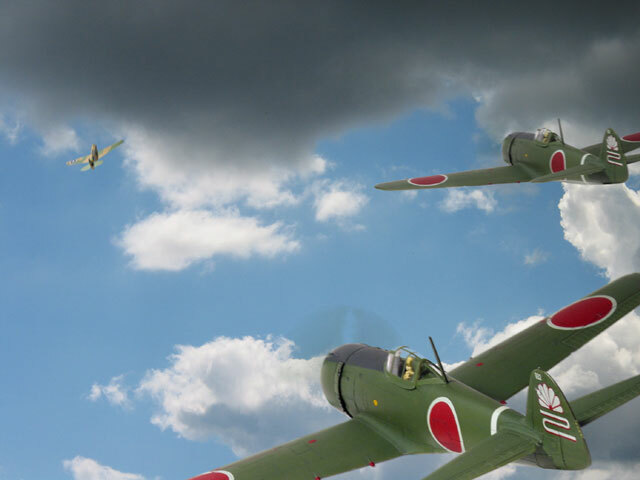 The Japanese pilots were "painted" using the Photoshop airbrush tool. AMT P-40, OOB, kit decals. Camouflage is freehand painted using a Badger 150 airbrush.